Professor Patrick Condon was one of the keynote speakers at a forum on Densification Options in Grandview-Woodland held on September 10, 2014. The forum was well attended and there was a lively discussion about city planning, housing, transit and human scale architecture. The second speaker, Richard Wozny shared his insights as a consultant to the real estate industry, to investors and to the governments. 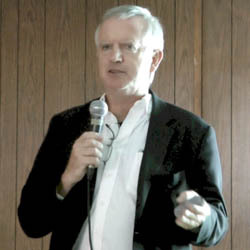 Wozny emphasized the role of infrastructure in shaping cities and future development. He noted that there’s a desire to “extract value” from infrastructure. This model of development may or may not take the form of towers clustered around major transit nodes. Condon used the example of several European cities to illustrate that there are ways to spread density more evenly, and to integrate with the existing infrastructure. He notes that Vancouver is originally organized around the concept of a streetcar city, and he makes a compelling case for improving transit along key arterial roads. He maintains that this is a much better way to spend $3 billion than building a subway to UBC. In addition to residents of Grandview-Woodland and other Vancouver neighbourhoods, there were representatives from the Green Party, COPE and the Cedar Party.